William Shankly OBE (2 September 1913 – 29 September 1981) was a Scottish football player and manager, who is best known for his time as manager of Liverpool. Shankly brought success to Liverpool, gaining promotion to the First Division and winning three League Championships and the UEFA Cup. He laid foundations on which his successors Bob Paisley and Joe Fagan were able to build by winning seven league titles and four European Cups in the ten seasons after Shankly retired in 1974. Shankly came from a small Scottish mining community and was one of five brothers who played football professionally. He played as a ball-winning right-half and was capped twelve times for Scotland, including seven wartime internationals. He spent one season at Carlisle United before spending the rest of his career at Preston North End, with whom he won the FA Cup in 1938. His playing career was interrupted by his service in the Royal Air Force during the Second World War. He became a manager after he retired from playing in 1949, returning to Carlisle United. He later managed Grimsby Town, Workington and Huddersfield Town before moving to become Liverpool manager in December 1959. Shankly took charge of Liverpool when they were in the Second Division and rebuilt the team into a major force in English and European football. He led Liverpool to the Second Division Championship to gain promotion to the top-flight First Division in 1962, before going on to win three First Division Championships, two FA Cups, four Charity Shields and one UEFA Cup. Shankly announced his surprise retirement from football a few weeks after Liverpool had won the 1974 FA Cup Final, having managed the club for 15 years, and was succeeded by his long-time assistant Bob Paisley. He led the Liverpool team out for the last time at Wembley for the 1974 FA Charity Shield. He died seven years later, aged 68. Bill Shankly was born in the small coal mining village of Glenbuck, Ayrshire, whose population in 1913, the year of Shankly's birth, was around 700. People born there would often move to find work in larger coal mines. As a result, Glenbuck became largely derelict and by the time Shankly's ghost writer John Roberts visited it in 1976, there were only 12 houses left, including a cottage owned by Shankly's sister, Elizabeth, whom Roberts described as "the last of the children of Glenbuck". Shankly's parents, John and Barbara, lived in one of the Auchenstilloch Cottages with their 10 children; five boys and five girls. Shankly was the ninth child and the youngest boy. Although he was known as Bill throughout his football career, his name in the family was Willie, pronounced [Wullie]. His father was a postman who became a tailor of handmade suits. Despite the football pedigree in his family, he did not play himself. All five Shankly brothers played professional football and Shankly claimed they could have beaten any five brothers in the world when they were all at their peaks. His brothers were Alec, known as Sandy by the family, who played for Ayr United and Clyde; Jimmy (1902–1972), who played for various clubs including Sheffield United and Southend United; John (1903–1960), who played for Portsmouth and Luton Town; and Bob (1910–1982), who played for Alloa Athletic and Falkirk. Bob became a successful manager, guiding Dundee to victory in the Scottish championship in 1962 and the semi-finals of the European Cup the following year. Their maternal uncles, Robert and William Blyth were professional players who both became club directors at Portsmouth and Carlisle United respectively. Shankly wrote in his autobiography that times were hard during his upbringing and that hunger was a prevailing condition, especially during the winter months. He admitted that he and his friends used to steal vegetables from nearby farms; bread, biscuits and fruit from suppliers' wagons, and bags of coal from the pits. Shankly admitted the act was wrong but insisted it was done out of devilment only because the root cause was their constant hunger. He said that he and his friends learned from their mistakes and became better people in later years. He was at school from age five until 14. Discipline at both home and school was strict but Shankly said it was character-building. His favourite subject was geography and he played football as often as possible, especially in the school playground, but there was no organised school team. After Shankly left school in 1928, he worked at a local mine alongside his brother Bob. He did this for two years until the pit closed and he faced unemployment. In his autobiography, he described the life of a miner at some length and mentioned many of the problems such as the sheer hard work, rats, the difficulties of eating and drinking at the coal face. The worst problem was the filth because the miners never felt really clean, even though they would go home to wash in a tub after each shift. Shankly's village team was called the Glenbuck Cherrypickers, a name probably derived from the 11th Hussars (the "Cherry Pickers"), but he said the club was near extinction when he had a trial and he never actually played for them. Shankly, aged 18, then played part of the 1931–32 season for Cronberry Eglinton, about 12 miles from Glenbuck. He used to cycle to and from the ground. Cronberry were in the Cumnock & District League. Although Shankly had less than one full season at Cronberry, he acknowledged his debt to Scottish Junior Football as he learned a lot, mainly by listening to older players and especially his brothers. Shankly had a single season, 1932–33, at Carlisle United, then relatively new to the Football League and playing in the Third Division North, their reserve side playing in the North Eastern League. Shankly was recommended by a scout called Peter Carruthers who had seen him playing for Cronberry. He was invited for a month's trial and said it was the first time he had left Scotland. He was signed after just one trial match for Carlisle's reserves against Middlesbrough reserves, even though Carlisle reserves lost the match 6–0. A local newspaper report said that he had worked hard and might develop into a useful left back. In fact, he developed into a top-class right-half. Shankly made his senior debut on 31 December 1932 in a 2–2 draw against Rochdale and made 16 appearances for the first team. At the end of the season, the reserves won the North Eastern League Cup, defeating Newcastle United reserves 1–0 in the final. In his 1976 autobiography, Shankly stated that he still had the medal. At this stage of his career, Shankly was assessed as "a hard running, gritty right-half"[nb 1] whose displays brought him much praise and credit. He was considered a promising key young player who was capable of taking Carlisle to greater things. He was paid four pounds ten shillings a week at Carlisle which he considered a good wage as the top rate at that time was eight pounds. Shankly was happy at Carlisle which was close to his home at Glenbuck and he had settled in well with almost a guarantee of first team football. When the opportunity came for him to move on, he was not convinced he wanted to leave. Soon after the 1932–33 season ended, Shankly received a telegram from Carlisle United asking him to return as soon as possible because another club wanted to sign him. Arriving at Carlisle, he discovered that the interested club was Preston North End who had offered a transfer fee of £500. The terms for Shankly personally were a fee of £50 plus a £10 signing-on fee and wages of five pounds a week. Shankly's initial reaction was that it was not enough and the deal nearly fell through. His brother Alec pointed out to him that Preston were in the Second Division and a bigger club than Carlisle with the potential to regain First Division status. Alec convinced him that the opportunity was more important than what he would be paid immediately, stressing that it was what he would get later that counted. Shankly took his brother's advice and signed the Preston contract in a railway carriage. One of this season's discoveries, Bill Shankly, played with rare tenacity and uncommonly good ideas for a lad of 20. He is full of good football and possessed with unlimited energy; he should go far. In his autobiography, Shankly wrote that Preston had more than held their own in the 1934–35 season and the club was not relegated again until the end of the 1948–49 season in which he left them. Shankly developed into a tough half back, as good as any in the Football League. The outstanding Northern Ireland international Peter Doherty recalled how Shankly dogged his footsteps in one match and kept muttering: "Great wee team, North End, great wee team", subduing Doherty completely as Preston defeated Manchester City 3–1. In 1936–37, Preston reached the FA Cup Final but were well beaten 3–1 by Sunderland at Wembley Stadium. Preston recovered to reach the 1938 FA Cup Final in which they defeated Huddersfield Town 1–0 with a penalty scored by George Mutch in the final minute of extra time. As well as winning the FA Cup, Preston finished third in the league. That season marked the pinnacle of Shankly's playing career. With the resumption of full League football again in the 1946–47 season, Shankly returned to Preston who held his registration, but he was now 33 and coming to the end of his playing days. By 1949, he was Preston's club captain but had lost his place in the first team, which was struggling against relegation despite having Tom Finney in the side. Shankly was a qualified masseur and had decided he wanted to become a coach so, when Carlisle United asked him to become their manager in March of that year, he retired as a player and accepted the job. Shankly's departure from Preston was resented by some at the club and he was refused a benefit match, to which he felt entitled. He described Preston's attitude as the biggest let-down of his life in football. Shankly had enormous admiration for Tom Finney and devotes more than three pages of his autobiography to Finney's prowess as a footballer. In the 1970s, Shankly was asked how a current star compared to Finney and Shankly replied: "Aye, he's as good as Tommy – but then Tommy's nearly 60 now". Another Preston player admired by Shankly was his Scottish international teammate Andy Beattie, with whom he would later work in management. Shankly was succeeded in the Preston team by Tommy Docherty and Shankly told Docherty that he should just put the number four shirt on and let it run round by itself because it knows where to go. Shankly played for Scotland 12 times from 1938 to 1943 in five full and seven wartime internationals. He spoke of his "unbelievable pride" when playing for Scotland against England and how, when confronted by the "Auld Enemy", the Scottish players would become William Wallace or Robert the Bruce for 90 minutes after pulling on the blue jersey. Shankly himself certainly had that spirit when playing for Scotland as confirmed by Alex James, who said of Shankly: "He is a real Scotland player who will fight until he drops". Shankly made his international debut on 9 April 1938 against England at Wembley; Scotland winning the match 1–0 with a late goal by Tommy Walker. Nine of his Scotland appearances were against England and the others were against Northern Ireland, Wales and Hungary. He was Scotland's captain in the wartime match against England at Hampden Park, attended by 78,000 people on 3 May 1941, but Scotland lost that game 1–3. Perhaps his most memorable international was the wartime game at Wembley on 18 April 1942 when Scotland won 5–4 and Shankly scored his only Scotland goal. A post-match report said that Scotland's success was inspired by "the Busby–Shankly victory service" when Shankly and his future management rival Matt Busby combined to help Scotland's cause. According to the Liverpool website, Shankly's goal was "probably the strangest national goal ever". He took a speculative shot towards goal from 50 yards and the ball bounced over the England goalkeeper's head and into the net. In January 1973, when Shankly was the subject of This Is Your Life, the goal was shown and Shankly commented that "they all count and we won". Shankly declared in his autobiography that he specialised in what he called "the art of tackling", emphasising that it is an art. He wrote that he was never sent off or booked by a referee. In his view, the art of tackling is in the timing and the sole object is to win the ball. He wrote that even if the opponent is injured in the tackle, it is not a foul if you have timed everything right and you've won the ball. His philosophy, therefore, was to play hard but fair with no cheating. During his playing career, Shankly said he would not argue with referees. He realised after taking the advice of his brothers that it is a waste of time. The referee, he wrote, always wins in the end. Shankly was always noted for his dedication to football and, in his playing days, would do his own training during the summer months. During the summer of 1933 when he returned to Glenbuck after completing his first season as a professional, he decided to develop his throw-in skills. He was an early exponent of the long throw-in - he practised by throwing balls over a row of houses and the small boys of the village helped by fetching them back for him. Shankly wrote in his autobiography that he had long prepared himself for a career as a football manager. He had absorbed all the coaching systems with any useful qualifications and had full confidence in his ability and in himself to be a leader. For him, he had done the hard work and it was simply a question of waiting for an opportunity to present itself. Shankly summed up the essential criteria for success in football management when he claimed he could speak common sense about the game and could spot a good player. In spotting a player, he always applied a basic formula which was that, first and foremost, the player must have both ability and courage. Other attributes were physical fitness and willingness to work, especially to struggle against the odds. Shankly used psychology to motivate his players, for example telling them that the opposition had had a very tiring journey and were not fit to play the match. He urged the local population to support the team and would use the public address system at matches to tell the crowd about his team changes and how his strategy was improving the team. Shankly recalled that Brunton Park was dilapidated, writing that the main stand was falling to pieces and the terraces derelict. He even burned all the kit. When the team was travelling to Lincoln City, he saw a sportswear shop in Doncaster and stopped the coach to buy a full set of kit in which the team played at Lincoln. Season ticket sales in 1950–51 reached an all-time high and Carlisle challenged strongly for promotion as well as achieving a draw with Arsenal at Highbury in the FA Cup. It ended badly, however, because Shankly accused the club's board of reneging on a bonus promise for the players should the team finish in the top three of the league. He resigned and accepted an offer from Grimsby Town. Shankly's overall record in league football at Carlisle was 42 wins and 22 defeats from 95 matches. After an unsuccessful interview at Liverpool, Shankly moved to manage Grimsby Town in June 1951. He said in his autobiography that there was greater potential at Grimsby than at Carlisle. His main problems were that Grimsby had been relegated twice in recent seasons, dropping from the First to the Third Division, and some good players had been transferred before he arrived. Even so, Shankly believed he still had good players to work with and was able to buy some additional players on the transfer market for low fees. Pound for pound, and class for class, the best football team I have seen in England since the war. In the league they were in, they played football nobody else could play. Everything was measured, planned and perfected and you could not wish to see more entertaining football. Shankly's biographer Stephen Kelly quotes the "pound for pound" analysis but qualifies it as another of Shankly's slight, though well-meant, exaggerations. Kelly added that this kind of talk by Shankly could only boost morale at the club. Shankly made great use of five-a-side football in training at Grimsby, playing these games as if they were competitive cup or league matches. The games would last an hour each time. Shankly worked on set pieces such as throw-ins and tried to devise a method of counter-attacking from corners conceded. Grimsby's ageing team made a bright start in 1952–53 with five straight wins but eventually slipped and finished in fifth place. In 1953–54, Shankly became disillusioned when the board could not give him money to buy new players. He was reluctant to promote some promising reserves because of loyalty to the older players (a fault that was to resurface at Liverpool years later) and he finally resigned in January 1954, citing the board's lack of ambition as his main reason. In his autobiography, he said that he and his wife were feeling homesick in Grimsby and, when an opportunity came to manage Workington, he was attracted to the challenge partly because they would be closer to Scotland. Shankly's record in league football at Grimsby was 62 wins and 35 defeats from 118 matches. Although the Workington team was close to the bottom of the Third Division North, Shankly saw it as a challenge and attacked the job with all of his usual enthusiasm and relish. Workington rose to 18th by the end of the 1953–54 season and so did not have to apply for re-election. In 1954–55, the team finished a creditable eighth and saw a rise in attendances from 6,000 to 8,000. Workington operated on a shoestring and Shankly had to do much of the administration work himself, including answering the telephone and dealing with the mail by using an old typewriter to answer letters. In addition, he had the risky job of going to the bank each week to collect the payroll. One of his main problems was sharing the ground with the local rugby league club and Shankly was very concerned about the damage done to the playing surface by the rugby players. The situation led to numerous arguments with the club's board which, as Kelly records, included a majority of rugby league men whose interest in football took second place to rugby. Other players in Shankly's Huddersfield team were Ken Taylor, who was an England Test cricketer; striker Les Massie and captain Bill McGarry. On 21 December 1957, Huddersfield lost 7–6 to Charlton Athletic, who played most of the match with ten men, after Huddersfield were leading 5–1 with just 27 minutes remaining. Shankly described it as one of the most amazing games he had ever seen. On another occasion, Huddersfield beat Liverpool 5–0 with ten men and Shankly recalled the Liverpool directors leaving the ground in single file as if they were in a funeral procession. Disillusioned by a board that wanted to sell his best players without offering money to buy replacements, Shankly felt stifled by Huddersfield's lack of ambition and was delighted in November 1959 to receive an approach for his services by Liverpool. He recalled how Liverpool chairman Tom (T.V.) Williams asked him if he would like to manage the best club in the country, to which Shankly replied: "Why, is Matt Busby packing up?" Shankly decided to think about the offer as he realised the great potential at Liverpool, who like Huddersfield were in the Second Division at that time. Rumours began and were fuelled by Liverpool's visit to Leeds Road on 28 November. Although Huddersfield won the game 1–0, Shankly accepted the Liverpool offer and resigned his position as Huddersfield manager at a board meeting on 1 December 1959. His league record at Huddersfield was 49 wins and 47 defeats in 129 matches. After only one match I knew that the team as a whole was not good enough. I made up my mind that we needed strengthening through the middle, a goalkeeper and a centre half who between them could stop goals, and somebody up front to create goals and score them. To deal with what he saw as a below average playing squad, he placed 24 players on the transfer list. All of them had left the club within one year. Shankly resolutely pursued his strength through the middle goal and always knew which three players he needed to achieve it. Melwood was overgrown and had only an old wooden cricket pavilion. Shankly commented that one of the pitches looked as if bombs had been dropped on it and he asked if the Germans had been over in the war. He instituted a development programme to cultivate the site and modernise the facilities. In the meantime, he arranged for the players to meet and change at Anfield before going to and from Melwood by bus. According to Kelly, Liverpool's eventual success was based on hard work done in the training system that Shankly, Paisley, Fagan and Bennett introduced at Melwood. Shankly deplored long distance running on roads and insisted that, apart from warm-up exercises or any special exercises needed to overcome injuries, the players trained on grass using a ball. Everything was done systematically with players rotating through exercise routines in groups with the purpose of achieving set targets. Five-a-side games, as at all Shankly's earlier clubs, were at the heart of the system and he again insisted on these being as competitive as league matches. One particular routine designed to develop stamina, reflexes and ball skills was the "sweat box" which Shankly described as: "using boards like the walls of a house with players playing the ball off one wall and on to the next; the ball was played against the boards, you controlled it, turned around and took it again". Shankly got the idea from a routine he had seen Tom Finney use at Preston to hone his skills. After experimenting with the routine, he set the players a limit of two minutes per session. The system was geared to Shankly's simple philosophy of "pass and move", which formed the basis of Liverpool's strategy. Shankly insisted on suitable cooling-off periods after training (now called "warming down") before the players took a bath and had a meal. The team changed the studs in their boots to suit all playing conditions. Shankly summarised the entire strategy in terms of attention to detail with nothing left to chance. Liverpool's recovery depended on new players being acquired and, in his autobiography, Shankly recalled the struggles he had with the board to make them realise the club's potential and the need to spend money on good players. He said there were times when he felt like walking out. He found a valuable ally in Eric Sawyer, of the Littlewoods pools organisation, who joined the board not long after Shankly's appointment and shared Shankly's vision of Liverpool as the best club in England. At one board meeting in 1961 when Shankly insisted the club make offers for two players in Scotland, the board's initial response was that they couldn't afford them, but Sawyer stepped in and said: "We can't afford not to buy them". The two Scottish players were centre half Ron Yeats and centre forward Ian St John from Dundee United and Motherwell respectively. With Sawyer's help, Shankly signed them both in the spring of 1961 and challenged the Liverpool board to sack him if they couldn't play. At a press conference when Yeats came to Liverpool, Shankly emphasised Yeats' height by inviting the journalists to "go and walk round him; he's a colossus!" Goalkeeper Tommy Lawrence came through the club's junior teams, so Shankly now had his "strength through the middle" and the team building continued with the acquisition of wing half Gordon Milne from Preston. Other players developed at Anfield were Jimmy Melia, Ronnie Moran, Alan A'Court and the future England internationals Gerry Byrne and Roger Hunt. Shankly said of goalscorer Hunt the first time he saw him: "Christ, this one can play!" Liverpool had finished third in both 1959–60 and 1960–61 (only the top two clubs were promoted); but the new team gained promotion in the 1961–62 season by winning the Second Division championship, Hunt scoring 41 goals. Liverpool consolidated in 1962–63, finishing eighth in their first top flight season under Shankly's management. Significant signings were wing half Willie Stevenson from Rangers in 1962 and left winger Peter Thompson from Preston in 1963. Shankly described the Thompson deal as "daylight robbery". Liverpool's youth system produced more future England internationals in Ian Callaghan, Tommy Smith and Chris Lawler. The hard work paid off in 1963–64 when Liverpool won their sixth League Championship title, ending the season with a 5–0 defeat of Arsenal at Anfield. According to Roger Hunt, the secret of Liverpool's success was that, under Shankly, they were the fittest team in the country. In 1964, Jimmy Melia was transferred to Wolverhampton Wanderers; with Shankly buying Arsenal's utility player Geoff Strong for £40,000 and this was Liverpool's last significant transfer activity until 1967. One of Shankly's greatest ambitions when he joined Liverpool was to win the FA Cup and, after he signed Yeats and St John, he told the club directors that they would win it with these two players in the team. It was St John who scored the winning goal in May 1965 when Liverpool did win the FA Cup for the first time in the club's history with a 2–1 extra time victory over Leeds United at Wembley. In his autobiography, Shankly recounted that among his many achievements, winning the 1965 FA Cup final was his greatest day in football. Liverpool made their European debut in 1964–65, competing in the European Cup and reaching the semi-finals. In the second round, the club was drawn against the formidable Anderlecht. Immediately before the match, Shankly decided to experiment with the Liverpool kit. Liverpool played in red shirts with white shorts and white socks with red tops but Shankly and Ian St John had the idea of an all-red kit that would give the impression the players were taller. Liverpool played in all-red only for European matches but quickly adopted the colour permanently. Three days after winning the FA Cup, Liverpool defeated European champions Internazionale 3–1 at Anfield in the semi-final first leg with a performance that was saluted by Inter's coach Helenio Herrera. The second leg at the San Siro remains controversial because, according to Shankly, the match was "a war" which Liverpool lost 3–0 and so were knocked out of the competition 4–3 on aggregate. Eleven years later, Shankly maintained that two of Inter's goals were illegal. Even today, the Liverpool website describes the match by saying that Liverpool were denied at the semi-final stage by a dishonest referee in Milan. According to Kelly, however, video evidence shows that the two disputed goals were actually legitimate. Shankly said after the defeat in Milan that the Inter fans were going mad because they were so pleased to have beaten Liverpool and he insisted it proved the high standard to which the Liverpool team had raised itself. In the 1964–65 Football League Championship, Liverpool dropped from first to seventh with 13 fewer points than the previous season, perhaps due to the exertion of lengthy participation in the FA and European Cups. In 1965–66, Liverpool regained the League Championship title and reached the final of the European Cup Winners' Cup at Hampden Park, where they lost 2–1 in extra time to Borussia Dortmund. Shankly's summary of that final, played on a wet night, was that the team didn't play well and gave away "two silly goals". Shankly and Paisley had learned a great deal about European football which Liverpool would eventually turn into trophies. Their strategy in two-legged ties would be containment away and attack at home. Shankly had applied the principle in a preliminary round tie against Juventus when Liverpool were away in the first leg. Despite Juventus taking the lead after 81 minutes, Shankly ordered his players to ensure the deficit was only one goal. Liverpool then switched to all-out attack in the second leg at Anfield and won 2–0 (2–1 aggregate). Liverpool began the 1966–67 season by beating neighbours Everton in the FA Charity Shield match but the team were never really in contention for major honours that season, finishing fifth in the league. Shankly recognised the potential of Blackpool teenager Emlyn Hughes, a future England captain, and signed him for £65,000 in February 1967. Liverpool's performance in the 1966–67 European Cup was poor and, after struggling to overcome FC Petrolul Ploiești in the first round, they were well beaten in the last 16 by Ajax Amsterdam, inspired by 19-year-old Johan Cruyff. Ajax won 7–3 on aggregate after defeating Liverpool 5–1 in Amsterdam. Several years later, in his autobiography, Shankly still complained that the match in Amsterdam should never have started because of fog and, although Liverpool lost 5–1, he still thought Liverpool would win the tie at Anfield. Although Shankly claimed to have been unworried about the Ajax defeat, he acknowledged that he was examining the team and planning ahead. The Liverpool site argues that Shankly was mistaken in his decision at this time to postpone team rebuilding. Liverpool improved their league performances over the next two years, finishing third in 1967–68 and then second in 1968–69, although to Shankly himself it was "a mediocre time in the late 1960s as we prepared for the 1970s". Shankly made two controversial signings in this period which did not turn out as he had hoped. In 1967, he signed striker Tony Hateley from Chelsea for a club record £96,000 and then felt obliged to transfer him to Coventry City only a year later. He wrote that bad luck and injuries disrupted the progress of two other prospects Alf Arrowsmith and Gordon Wallace; Shankly had compared the latter to Tom Finney. In September 1968, he paid £100,000 to Wolverhampton Wanderers for their teenage striker Alun Evans who thus became "football's first £100,000 teenager". Evans started well and produced some outstanding performances during his four years at the club but Shankly eventually had to sell him to Aston Villa. He later recalled that Evans was scarred by a glass in a nightclub incident which, in Shankly's opinion, had a detrimental impact on his career. The only long-term success that Shankly had in the transfer market in the late 1960s was his signing of Emlyn Hughes, who went on to captain Liverpool to victory in the European Cup. Otherwise, he did not significantly change the team until the 1969–70 season when Liverpool finished fifth in the league championship, a long way behind the winners, their local rivals Everton. Shankly was characteristically defiant whenever Everton got the better of Liverpool and, although he liked and respected everyone connected with Everton, would always talk up Liverpool at Everton's expense. Typical of this was his joke about the city having two great football teams – Liverpool and Liverpool reserves. Many of the new players came to Liverpool because of a new scouting system created by Shankly in 1967 and placed under the control of new chief scout Geoff Twentyman, who had played for Shankly at Carlisle and had then spent several seasons at Liverpool, retiring shortly before Shankly's appointment. According to Stephen Kelly, hiring Twentyman as chief scout was "perhaps Shankly's finest signing ever". It was through Twentyman that Liverpool found the new players and, after Shankly retired, Twentyman gave sterling service to Bob Paisley and Joe Fagan by finding players including Phil Neal, Alan Hansen and Ian Rush. As always, Shankly kept things simple and Twentyman was told to look for a prospect's basic qualities which were the abilities to pass the ball and move into position to receive a pass. Shankly also wanted Twentyman to check the player's personality and ensure he had the right attitude for a professional footballer. Above all, said Twentyman, "he wanted to know if the lad had the heart to play for Liverpool". Although Shankly sometimes paid large transfer fees he was loath to do so and Twentyman's brief was to find young players so he (Shankly) could mould them into what he wanted. The new team began promisingly in 1970–71 by retaining fifth place in the league and reaching the semi-finals of the Inter-Cities Fairs Cup where they lost 0–1 to a very experienced Leeds United side. The highlight of Liverpool's European campaign that season was a 4–1 aggregate victory in the quarter-final over Bayern Munich. For the first time since winning the competition in 1965, Liverpool reached the FA Cup Final but, as in the Fairs Cup, experience was the major factor and Shankly's young team were beaten 2–1 by league champions Arsenal despite having taken the lead in extra time through a Steve Heighway goal. Watching from the sidelines was another new player whom Shankly had recently signed from Scunthorpe United for £35,000 on Twentyman's recommendation. This was Kevin Keegan and he was such an important addition to the new Liverpool team that Shankly devoted an entire chapter of his autobiography to him entitled A Boy Called Keegan. Shankly summarised Keegan as "the inspiration of the new team". Shankly had always been noted for his use of psychology, both to encourage his own players and to raise doubt in the minds of opponents. One of his lasting innovations is the "THIS IS ANFIELD" plaque secured to the wall above the players' tunnel. Coupled with the roar of the crowd, it was designed to intimidate. In the first match after it was erected, Liverpool defeated Newcastle United 5–0, despite an attempt by Malcolm Macdonald to joke about the sign. Shankly would try to boost the confidence of his own players by announcing that a key opponent was unfit. When Keegan was about to play against Bobby Moore for the first time, Shankly told him that Moore had been out at a night club and was hung over. Afterwards, Keegan having produced an outstanding performance against the equally outstanding Moore, Shankly told him that Moore had been brilliant that day and Keegan would never play against anyone better. 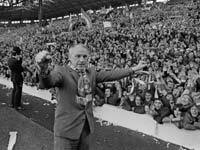 In 1972–73, Liverpool won the club's eighth league title and their third under Shankly. A massive bonus for the club was winning the UEFA Cup, the club's first European success. In the two-legged final they faced Borussia Mönchengladbach, whom Shankly rated the best team in Europe. The first leg at Anfield had to be played twice after an abandonment due to heavy rain which flooded the pitch. Shankly had left John Toshack out of the team but then, having studied the Borussia defence, recalled him for the rematch the following night. Toshack used his height and heading ability to great effect and created two goals for Keegan as Liverpool won 3–0. The second leg in Mönchengladbach was a different story as Borussia took an early 2–0 lead and Shankly admitted he thought the final was lost, but Liverpool held on to win the final by an aggregate score of 3–2. It was the first time an English club had won both the league title and a European trophy in the same season. In his autobiography, Shankly wrote: "Right from the start as a manager [i.e., when he was at Carlisle] I tried to show that the fans are the people that matter. You've got to know how to treat them (and) have them on your side". This was particularly true at Liverpool and Shankly said he was made for Liverpool where the people that matter most are the ones who come through the turnstiles. He added that a manager has got to identify himself with the people because their team is something that really matters to them. In return, he said, the support of the Liverpool fans for their team had been incredible. Shankly emphasised the importance of communication with the supporters. At Carlisle he used to speak to them over the public address system before matches. Rather than just putting a few lines in the match programme, he preferred to speak and explain his team changes and his views about the previous match. At Workington, he would answer supporters' letters in person, using an old typewriter. He said he preferred to phone business people as he would put as little as possible in writing when dealing with them. He would readily obtain match tickets for fans whom he considered to be deserving cases and wrote in his autobiography that he would give people anything within reason. Shankly formed a special bond with the Liverpool supporters and, at the end of the 1961–62 season when Liverpool won the Second Division championship, he told the Liverpool Echo: "In all sincerity, I can say that they are the greatest crowd of supporters in the game". In Tommy Smith's view, Shankly was completely in tune with the city of Liverpool; he loved the supporters and they loved him, mainly because they knew he understood them. Shankly was 60 when Liverpool won the 1974 FA Cup final and said in his autobiography that, on returning to the dressing room at the end of the match, he felt tired from all the years. His mind was made up and he knew he was going to retire. His wife, Nessie, had asked him to retire a year earlier but he decided that was not the right time. Tommy Smith said that Shankly's feelings for Nessie were undoubtedly a major reason for his decision. In 1974, he decided that he could leave Liverpool with pride in a job well done and only one regret, which was that he did not win the European Cup. Shankly had considered retirement in previous years. The Liverpool secretary Peter Robinson was initially blasé in 1974 but, when he realised Shankly was serious this time, tried to make him change his mind. Shankly's granddaughter, Karen Gill, said to The Observer in 2009: "I think that perhaps it was tiredness, that football had taken its toll on him". In her 2006 book about her grandfather, Karen Gill said Shankly never professed anything privately about retirement that he did not declare publicly. She did not agree that there was any hidden motive behind his decision and she thought Brian Clough's view about tiredness was probably correct. It is with great regret that I as chairman of Liverpool Football Club have to inform you that Mr Shankly has intimated that he wishes to retire from active participation in league football. And the board has with extreme reluctance accepted his decision. I would like to at this stage place on record the board's great appreciation of Mr Shankly's magnificent achievements over the period of his managership. Shankly soon regretted his decision and tried to continue his involvement with the club, mainly by turning up for team training at Melwood. He said he still wanted the involvement as the club had become his life. He soon stopped going to Melwood because he felt there was some resentment and people were asking what he was doing there. He still attended matches, but sat in the stand away from the directors and staff. He was especially annoyed that Liverpool did not invite him to attend away matches as the club's guest. When, finally, he was invited to travel with them to the away leg of the 1976 UEFA Cup Final in Bruges, he was accommodated in a separate hotel and said he found that insulting. Shankly contrasted Liverpool's attitude with what he encountered at other clubs, including Liverpool's great rivals Everton and Manchester United, where he was received warmly. He recalled Manchester United manager Tommy Docherty's comment to a Liverpool director that he (Shankly) was welcome at Old Trafford. About Everton, once his greatest rivals, he wrote that he had been received more warmly by Everton than by Liverpool. He said it was a scandal that he needed to say that about the club he had helped to build. From Liverpool's point of view, the situation was that Shankly had retired and the club had to move on. Shankly did not understand that by turning up for training at Melwood, he was effectively undermining Bob Paisley, who had succeeded him as manager, even to the point of actually taking over the training. Tommy Smith recalled that Shankly as manager never ran training and would only speak to Paisley, Fagan and Bennett about what needed to be done. As a visitor at Melwood, he began to intervene and Paisley's initial pleasure on seeing him soon turned to polite embarrassment. Eventually, Paisley had to point out to Shankly that he did not work there any more, that it was now Paisley's team and that he had things which he wanted to do with the team. At a football club, there's a holy trinity – the players, the manager and the supporters. Directors don't come into it. They are only there to sign the cheques. Although some club officials like secretary Peter Robinson wanted bygones to be bygones, Tommy Smith summarised the board's view as one of satisfaction that Shankly had gone at last. It should be remembered that perception of Shankly was an overbearing figure who would certainly use a position on the board to be a "back-seat driver" and the board were well aware that Matt Busby's time as a Manchester United director had been disastrous, their team just having been relegated. Whilst Liverpool's treatment of Shankly may have seemed disrespectful, they were acting in the best interests of the club and its new manager by pursuing the same relentless winning ethic that Shankly himself had instilled. In any event, their perceived ruthlessness was vindicated by the unprecedented haul of League Championship titles and European Cups won over the next decade under Bob Paisley and Joe Fagan. Shankly was awarded the OBE in November 1974, four months after he retired as Liverpool manager. He and Nessie went to Buckingham Palace and, according to Kelly, that was a rare day out for them. They continued to live in the semi-detached house at West Derby, near the Everton training ground at Bellefield, which they bought when they moved to Liverpool in 1959. After Shankly's death in 1981, Nessie lived there alone until she died in August 2002. Shankly tried to keep busy in retirement and stay in touch with football. He worked for Radio City 96.7, a Liverpool station on which he presented his own chat show, once interviewing prime minister Harold Wilson, and was a pundit on its football coverage. He briefly took up advisory roles at Wrexham and then at Tranmere Rovers, helping former Liverpool captain Ron Yeats at the latter. In November 1976, the press speculated that Shankly would make a return to management as the successor to Dave Mackay at Derby County, but the position went to Colin Murphy instead. The following year Shankly privately expressed an interest in taking the Everton job, a move which would have caused a sensation in Football. Shankly stated “They’ve had enough of Billy Bingham and they are looking for a new manager. Tommy Docherty has let them know I could be interested and I tell you this, if they contact me and the offer is right I’ll take the job.”  John Toshack recalled that Shankly was a great help to him when he went into management with Swansea City in 1978. Despite being in his sixties, Shankly kept himself fit and often took part in five-a-side football. If nothing else was available he would join teams of youngsters in kickabouts. On the morning of 26 September 1981, Bill Shankly was admitted to Broadgreen Hospital following a heart attack. His condition appeared to be stable and there was no suggestion that his life was in danger. On the following Monday morning, his condition suddenly deteriorated and was transferred into intensive care. At 00:30 on 29 September, he suffered another cardiac arrest and was certified dead, aged 68, at 01:20. He was cremated at the Anfield Crematorium on 2 October and his ashes were scattered on the Anfield pitch at the Kop end. Liverpool erected the 15-foot high cast-iron Shankly Gates in front of the Anfield Road stand. Inscribed "You'll Never Walk Alone", they were opened by Nessie Shankly at a low-key ceremony in August 1982. In 1997, a seven-foot tall bronze statue of Shankly was unveiled outside the stadium. It bears the legend: "He made the people happy". From the mid-1990s, Preston North End started a complete re-building of Deepdale to convert it into a modern all-seater stadium. When the former Spion Kop end was replaced by a new stand in 1998, it was named the Bill Shankly Kop and was designed with different coloured seats providing an image of Shankly's head and shoulders. Shankly was made an inaugural inductee of the English Football Hall of Fame in 2002, in recognition of his impact on the English game as a manager. David Peace's biographical novel Red or Dead, published in 2013, is a fictionalised account of Shankly's career as Liverpool manager. The novel was short-listed for the inaugural Goldsmiths Prize (2013). A hotel and museum opened in Liverpool in August 2015 dedicated to the life and career of Bill Shankly. Stephen Kelly, in his 1997 biography of Shankly, calls him "the ultimate obsessive". Shankly was fanatical about Liverpool and about football in general. From coaching his players and arguing with journalists to buttonholing fans in pubs, all Shankly ever wanted to do was talk about football and to be involved in football. As a result, he had few interests outside the game other than his family. His wife Nessie told Kelly that Shankly would spend time in the garden, mowing and weeding. She could rely on him to clean the cooker when Liverpool lost. Family holidays were limited to a week in Blackpool, where they always stayed at the Norbreck Hotel. One non-football activity that Shankly did enjoy was playing cards and Ian St John said he loved it, always taking part on long coach trips to away matches. Kelly wrote that, although it was said half-jokingly, so far as Shankly was concerned there was a degree of truth in what he had said. Shankly had fully realised the importance of football to its die-hard fans, himself included. It had become too important. Ian St John agreed that much of Shankly's behaviour was "bizarre", but everything was done with a purpose because Shankly always knew what he was doing and what he was saying. In his autobiography, Shankly gave insights into his character such as his world-view as a socialist, explaining that the socialism he believed in was not about politics but about collectivism, with everyone working for each other and enjoying a share of the rewards. That was the basis of his approach to football which is a team game in which everyone works together and shares the rewards. He admitted to idolising Robert Burns, whose birthplace was only 26 miles from Glenbuck and he was inspired by many of Burns' philosophical quotations, such as A man's a man for a' that. Shankly had no time for bigotry or prejudice, especially arising from differences of religion. He compared the cities of Glasgow and Liverpool by saying that there is nothing like the Rangers–Celtic situation in Liverpool because the supporters of Liverpool and Everton are a mixed bunch whose religion is football. Shankly's public persona was that of a "tough guy" with the swagger of his favourite film star James Cagney but privately he was very different. Joe Mercer described his "heart of gold" and likened him to a Border Collie who drives his sheep but could never hurt them. Liverpool's perceived failings in the late 1960s have been attributed to Shankly's reluctance to drop his long-serving players even though they were past their best. Bob Paisley said it was Shankly's one failing and it was because he was "a softie at heart". Basically as an honest man in a game that is sometimes short on honesty. That I've been working honestly for the people of Liverpool to try and give them entertainment. ^ a b The position of wing half is now obsolete in football terminology but it was an important role at the time of Shankly's career when teams routinely played in a 2–3–5 formation. The wing halves (right and left) played outside the centre-half in the middle three. Although some wing halves were more creative than defensive, Shankly's job was to win the ball (hence his emphasis on his tackling skills) and move it forward, so he was the equivalent of what is called a holding midfielder in 21st century football. ^ "Bill Shankly". Barry Hugman's Footballers. Retrieved 31 March 2017. ^ a b Allen, Tom (1990). Team from Beyond the Hills. Martin Wingfield. ^ a b Allen, Tom (1 November 2005). Reds Remembered: The Definitive Workington AFC. Soccerdata. ISBN 1899468234. ^ "Bill Shankly: Timeline". LFCHistory.net. Retrieved 29 August 2015. ^ a b c Shankly, p. 9. ^ a b c Kelly, p. 12. ^ a b Kelly, p. 16. ^ a b c Shankly, p. 27. ^ "Cronberry Eglinton". LFCHistory.net. Retrieved 24 March 2012. ^ a b c "Carlisle United (Player)". LFCHistory.net. Retrieved 24 March 2012. ^ a b c Kelly, p. 23. ^ a b c d e f g h i j k "Preston North End". LFCHistory.net. Retrieved 24 March 2012. ^ a b Shankly, p. 40. ^ a b Shankly, p. 41. ^ a b Shankly, p. 52. ^ a b c Shankly, p. 60. ^ When Saturday Comes – The Half Decent Football Book, p. 143. ^ a b c d e f g "Scotland". LFCHistory.net. Retrieved 24 March 2012. ^ "This Is Your Life". tv.com. Retrieved 24 March 2012. ^ a b c d e Shankly, p. 31. ^ a b Shankly, p. 61. ^ a b c d "Carlisle United (Manager)". LFCHistory.net. Retrieved 24 March 2012. ^ a b Shankly, p. 66. ^ a b Shankly, p. 67. ^ a b Kelly, p. 77. ^ a b c Shankly, p. 68. ^ a b "Grimsby Town". LFCHistory.net. Retrieved 24 March 2012. ^ a b c "Workington". LFCHistory.net. Retrieved 24 March 2012. ^ a b "Huddersfield Town". LFCHistory.net. Retrieved 24 March 2012. ^ a b c d e f g h "Liverpool Sixties Team". LFCHistory.net. Retrieved 24 March 2012. ^ Shetty, Sanjeev (21 December 2001). "The legacy of the boot room". BBC Sport. Retrieved 24 March 2012. ^ a b Shankly, p. 87. ^ a b Shankly, p. 91. ^ a b c d Shankly, p. 106. ^ a b Kelly, p. 217. ^ a b Shankly, p. 107. ^ a b Shankly, p. 109. ^ a b c d "Liverpool Seventies Team". LFCHistory.net. Archived from the original on 25 March 2012. Retrieved 24 March 2012. ^ a b c d "Some people believe football is a matter of life and death... The wit and wisdom of Bill Shankly". Daily Mirror. 2 September 2010. Retrieved 26 March 2012. ^ a b Kelly, pp. 245–246. ^ a b Kelly, p. 126. ^ a b Shankly, p. 126. ^ a b Shankly, p. 175. ^ a b Shankly, p. 138. ^ a b Shankly, p. 170. ^ a b Shankly, p. 141. ^ a b Shankly, p. 142. ^ a b c d e f g Corbett, James (18 October 2009). "Bill Shankly: Life, Death and Football". London: The Observer. Retrieved 25 March 2012. ^ "Bill Shankly's Retirement". LFCHistory.net. Retrieved 24 March 2012. ^ a b Shankly, p. 144. ^ a b Shankly, p. 145. ^ "Manager profile: Bob Paisley". LFCHistory.net. Retrieved 26 July 2018. ^ "Manager profile: Joe Fagan". LFCHistory.net. Retrieved 26 July 2018. ^ "Bill Shankly's old home goes up for sale". icLiverpool. Retrieved 26 March 2012. ^ a b c d Kelly, p. 313. ^ "Remembering Bill Shankly". BBC Sport. 29 September 2006. Retrieved 25 July 2018. ^ "Deepdale Ground Guide". Preston North End. Archived from the original on 7 March 2009. Retrieved 26 March 2012. ^ "Wright Inducted into Hall of Fame". BBC Sport. 15 October 2005. Retrieved 26 March 2012. ^ Peace, David (2013). Red or Dead. London: Faber & Faber. ISBN 978-0-571-28066-7. ^ "Jim Crace makes Goldsmiths Prize shortlist". BBC News. 1 October 2013. Retrieved 25 July 2018. ^ "Bill Shankly-themed hotel to open in Liverpool". Liverpool Echo. 28 March 2014. Retrieved 26 July 2018. ^ a b Kelly, p. 3. ^ a b c Kelly, p. 293. ^ St John, p. 119. ^ St John, p. 92. ^ a b Kelly, p. 240. ^ "Bill Shankly's career in pictures". BBC Sport. 1 September 2013. Retrieved 27 September 2018. ^ "Shankly – Your memories". BBC. 11 October 2006. Retrieved 27 September 2018. ^ "England Player Honours – Professional Footballers' Association MeritAward". England Football Online. Retrieved 27 September 2018. ^ "Royal Mail celebrates 'Great Britons' with launch of latest special stamp collection". Royal Mail. 17 April 2013. Retrieved 26 April 2013. Gill, Karen Elizabeth (2006). The Real Bill Shankly. Liverpool: Trinity Mirror Sport Media. ISBN 1905266138. The 1941–42 season was the 69th season of competitive football in Scotland and third season of special wartime football during World War II. Huddersfield Town's 1956–57 campaign was a fairly poor season for the Terriers under Andy Beattie and then his assistant Bill Shankly, following the previous season's relegation from Division 1. They finished in 12th place with 42 points, 12 points behind 2nd placed Nottingham Forest, but only 12 points ahead of 20th placed Notts County. Huddersfield Town's 1957–58 campaign was a fairly mediocre season for the Terriers under Bill Shankly, who was taking charge for his first full season at Leeds Road. The season will be best remembered for the match against Charlton Athletic at The Valley on 21 December 1957. The match finished 7–6 to Charlton, after Charlton had only ten men for the majority of the match and the fact that with 27 minutes remaining, Town were leading 5–1 before losing the match. This remains the only match in professional football where a team has scored 6 goals and lost the match. Huddersfield Town's 1958–59 campaign was a season under Bill Shankly, which saw Town make little progress up the Division 2 table, with the team finishing in 14th place. Huddersfield Town's 1959–60 campaign was Town's best season following their relegation from Division 1 4 years earlier. The main points of the season were the resignation of Bill Shankly, who would then lead Liverpool to greatness in his years in charge. Their FA Cup win over West Ham United in the third round replay at Upton Park, which would inadvertently lead to the departure of Denis Law to Manchester City for a record-breaking fee of £55,000. Liverpool F.C. won its first championship title since 1946-47, thanks to a spectacular performance in its only second season in the top flight, following a lengthy stay in the Second Division. Manager Bill Shankly was hailed for the success, which meant the Scot had turned Liverpool from an average team in the Second Division to league champions in a little more than four years. Roger Hunt scored 31 league goals, while partner Ian St John managed 21 and Alf Arrowsmith 15, the trio being vital for the side that scored a club record 92 goals in the First Division. The 1965 FA Cup Final was an association football match between Liverpool and Leeds United on 1 May 1965 at Wembley Stadium, London. It was the final match of the 1964–65 FA Cup, the 93rd season of England's primary cup competition, the Football Association Challenge Cup, better known as the FA Cup. Liverpool were appearing in their third final, they had lost the previous two in 1914 and 1950, while Leeds were appearing in their first. Both teams entered the competition in the third round. The majority of Liverpool's matches were close affairs, they did not score more than two goals in any of their matches and this was also their biggest margin of victory. Leeds' matches ranged from close affairs to comfortable victories. They won their third round tie against Stockport County 3–0, while they beat Manchester United 1–0 in a semi-final replay following a 0–0 draw in the initial match. Watched by a crowd of 100,000, the first 90 minutes of the match were goalless as both sides struggled to create goalscoring chances. Liverpool defender Gerry Byrne broke his collarbone early in the match but carried on as there were no substitutes. He was involved in the opening goal in extra time. Byrne found striker Roger Hunt in the 93rd minute, with a cross from the right-hand side of the pitch, which Hunt headed into the Leeds goal to give Liverpool the lead. Leeds equalised seven minutes later when Billy Bremner scored. However, Liverpool regained the lead in the 117th minute when striker Ian St. John headed in a pass from Ian Callaghan. Liverpool won the match 2–1 to win the FA Cup for the first time. Liverpool manager Bill Shankly was delighted with his team's victory and hailed it as his greatest moment in management. His Leeds counterpart, Don Revie, conceded Liverpool had been the better team, but was determined to make amends the following season. The national media was critical of the final, labelling it 'boring'. Liverpool F.C. won its seventh league title, tying Arsenal's record. In the competitive Football League First Division, Liverpool breezed to the championship victory with a six-point cushion to Leeds and Burnley. Roger Hunt scored 29 league goals, which earned him a place in the England squad for the World Cup, where he became the first player to win the World Cup representing Liverpool. It was not until 44 years later that Fernando Torres played an active part in the Spanish team winning the World Cup as a Liverpool player. The season also saw Liverpool reaching its first European final, that of the Cup Winners Cup, losing 2-1 to West German side Borussia Dortmund at Hampden Park in Glasgow, a severe blow to manager Bill Shankly, who had hoped to win his first European trophy in his native Scotland. The club permanently adopted an all red strip at the start of this season. The 1974 FA Charity Shield was the 52nd FA Charity Shield, an annual English association football match played between the winners of the previous season's Football League First Division and FA Cup. The match was contested by Leeds United, the champions of the 1973–74 Football League First Division, and Liverpool, the 1973–74 FA Cup winners. It was held at Wembley Stadium on 10 August 1974. Watched by a crowd of 67,000 and televised (although not live as has often been claimed), the match ended in a 1–1 draw and was decided by a penalty shoot-out which was won 6–5 by Liverpool.The game was the first in which Bob Paisley and Brian Clough managed Liverpool and Leeds respectively. In recognition of his services to the club, Liverpool asked their retired manager Bill Shankly to lead the team out onto the field. The match is mostly remembered for Billy Bremner and Kevin Keegan being jointly dismissed from the field by referee Bob Matthewson in the 60th minute after they had a fight. Keegan, who claimed provocation, was furious about being sent off and threw his shirt away. Bremner copied him and the two players were afterwards charged with bringing football into disrepute. The FA Disciplinary Committee imposed tough punishments but were themselves heavily criticised by people in football who doubted their competence. Alun William Evans (born 30 April 1949) is an English former footballer who made his name as a centre forward in the Liverpool side rebuilt by Bill Shankly at the start of the 1970s. He was born in Kidderminster, Worcestershire. Archibald Watson Wright (23 November 1924 – 30 April 1990) was a Scottish footballer, who played as an inside forward. He played for Hamilton Academical, Clyde, Falkirk, Blackburn Rovers, Grimsby Town and Accrington Stanley.Wright was signed for a small fee by then Grimsby Town manager Bill Shankly in 1953.He later became manager of Airdrieonians, and was in charge there as of December 1964. Carlisle United have had over 40 managers since the club was founded in 1904. Amongst others they include Bill Shankly, a former United player who went on to make Liverpool Football League champions three times, Alan Ashman, who took Carlisle to the top of The Football League and Michael Knighton who in 1997 infamously took over the management role while he was chairman. This is a list of FA Cup winning football managers. Arsène Wenger has won the tournament on seven occasions as Arsenal manager. George Ramsay won the tournament on six occasions with Aston Villa. Two other managers have won the title on five occasions. James Fielding led Blackburn Rovers to success three consecutive seasons in 1884, 1885 and 1886.Seventeen men have won the tournament both as a player and as a manager: John Cameron as player-manager in 1901, Peter McWilliam, Billy Walker, Jimmy Seed, Matt Busby, Stan Seymour, Joe Smith, Bill Shankly, Joe Mercer, Don Revie, Bob Stokoe, Kenny Dalglish, Bobby Gould, Terry Venables, George Graham, Gianluca Vialli and Roberto Di Matteo. Cameron and Dalglish are the only two people who have guided their clubs to the title as player-managers, in 1901 and 1986 respectively. Two managers have won the title with two sides: Billy Walker with Sheffield Wednesday in 1935 and Nottingham Forest in 1959 and Herbert Chapman with Huddersfield Town in 1922 and Arsenal 1930. Ronnie Moran (28 February 1934 – 22 March 2017) was a Liverpool captain and coach who twice served as caretaker manager in the early 1990s. Having spent his entire playing career at the club, he then became a member of the Boot Room coaching staff with Bill Shankly, Bob Paisley, Joe Fagan and Reuben Bennett, and was the club's longest-serving employee when he retired in 1998. Moran died on 22 March 2017, at the age of 83, as a Liverpool legend. Spirit Of Shankly (SOS) is an unofficial supporters union for fans of Liverpool F.C.. Named after former Liverpool manager Bill Shankly, although the union was formed in early 2008 by disgruntled fans opposed to the former Liverpool F.C. ownership of Tom Hicks and George N. Gillett, Jr., it quickly developed into a cooperative representing its members (and by implication other Liverpool F.C. supporters) on a whole range of issues such as ticketing, travel and community and regeneration issues. Its ultimate aim is to seek fan ownership of LFC in the long term. Stanley Cullis (25 October 1916 – 28 February 2001) was a British professional footballer and manager, primarily for Wolverhampton Wanderers. During his term as manager between 1948 and 1964, Wolves became one of the strongest teams in the British game, winning the league title on three occasions, and playing a series of high-profile friendly matches against top European sides which acted as a precursor to the European Cup. The Liverpool Boot Room was a room at Anfield, home of Liverpool F.C., during the 1960s to the early 1990s where the coaching staff would sit, drink tea and discuss the team, tactics and ways of defeating the next opposing side.